Influenza, or the flu, is a viral infection that can cause severe illness or even death. The flu is particularly dangerous for older adults (over age 65) and young children (under age five). This virus is contagious, and it spreads from one person to another through droplets that get into the air and onto the surfaces that you touch. To prevent the spread of the flu, try to avoid individuals who are coughing and sneezing, and wash your hands very often. The flu shot is a form of the inactive (not live) flu virus. It is given by injection (needle). Brand names of the flu shot include Fluzone, FluLaval, Flucelvax, Fluvirin, Afluria, and Fluarix. The nasal spray is a live, attenuated (weak) version of the flu virus that is given intranasally (through your nose). The nasal spray is also known as FluMist. Under the age of two. Have a compromised (weak) immune system. Have other medical conditions that can put them at a higher risk of developing serious complications from the flu. Instead, talk to your doctor and opt for the flu shot. 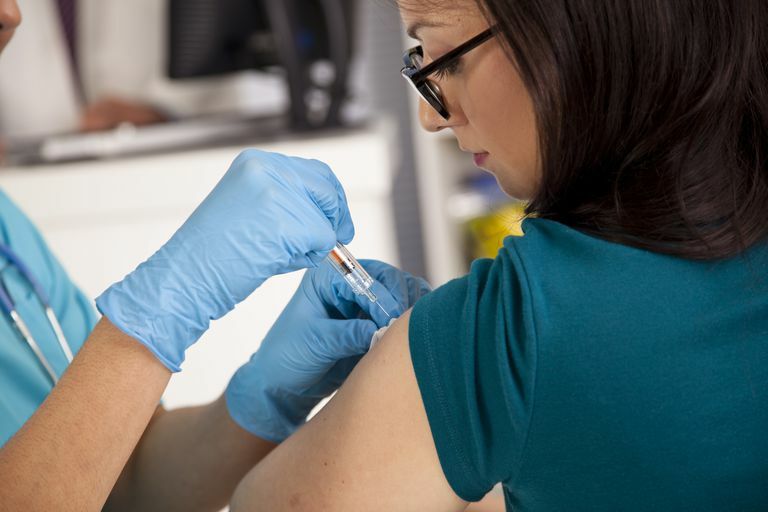 In the United States, the Centers for Disease Control and Prevention (CDC) along with the American Academy of Pediatrics (AAP) recommend a yearly flu shot for everyone over the age of six months. This recommendation includes pregnant women and women who are breastfeeding. The influenza vaccine is considered the safe choice of immunization during pregnancy and breastfeeding. If your baby is six months of age or older, a pediatrician may recommend that they are vaccinated against the flu, as well. If your child is less than six months old, they should not have a flu vaccination since it is not approved for infants under six months of age. However, if you get a flu shot while you're pregnant or right after your baby is born, it will still help your newborn or young infant. Your breast milk is full of protective antibodies and immune boosting properties. These protective properties pass through your breast milk and to your child to help him fight off illness and disease. There are different opinions about the safety of the live, but weak, flu vaccine in the nasal spray. Even though pregnant women should not receive the nasal spray vaccination, the CDC states that it is safe for breastfeeding women who are healthy and under the age of 50. However, the information provided in the package insert of the FluMist nasal spray vaccine states that there is not enough information to know how safe the vaccine is to use during breastfeeding. It also says that it is not known how much of the live virus in the vaccine, if any at all, will pass into the breast milk. While the actual danger is probably small, there are also other sources that do not recommend the flu nasal spray for breastfeeding women. So, when it's time to make your own decision, be sure to discuss the pros and cons of each type of vaccine with your doctor. The decision of whether or not to get vaccinated for the flu is ultimately up to you. The flu shot is safe. But it's not a required vaccination, and it doesn't protect you against all the strains of the flu virus. Even if you do get the flu vaccine, you can still come down with the flu. On the other hand, the flu shot can help protect you, your family, and your community from a flu outbreak. If you're having a tough time making this decision, and you aren't sure what you should do, consider your circumstances and discuss it with your doctor and your baby's doctor. Centers For Disease Control and Prevention. Influenza (Flu). U.S. Department of Health and Human Services. 2015. FluMist Quadrivalent Intranasal Spray. Package Insert. MedImmune: Gaithersburg, MD; 2015.